Young, powerful, passionate, hopeful — these are words that easily described Eva Peron, Argentina's most beloved female icon. Peron, also known as Evita, grew up poor and knew the struggles that the poorest communities faced, especially the women. Richard Davis, director of Evita at the Erie Playhouse, explains that Eva "did amazing things for Argentina. She created hospitals … she was very much about helping the poor." Even while Eva was dying of cancer, "she didn't let that stop her. She was working 15-16 hours a day to help people," says Davis. 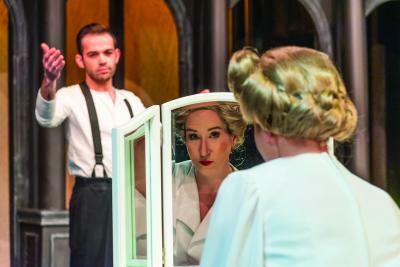 Kate Amatuzzo Thiem, who is playing the iconic role of Eva Peron, offers her perspective. "Eva Peron is an intriguing figure. She was such an ambitious woman, but at the same time, there were questionable actions involved," says Amatuzzo Thiem. To highlight these questionable actions, audiences may find themselves sympathizing with the show's antagonist, Che. Che, played by Brandon Vogt, is "the every man. He brings the other point to the table that maybe Eva is not as good as what people thought. He's the narrating voice," states Davis. Besides the complexity of Eva's character, another intriguing aspect of this musical is that the show is completely sung. Everything is expressed in song, and while there may be a few spoken lines here and there, expect to hear lots of incredible singing. Patrick Thiem plays Juan Peron, Argentina's President and Eva's husband. He had no trouble finding a spark between his character and Eva's — the two actors are married. Thiem clarifies that he "has always wanted to perform together with Kate, and when seeing this show, knew this was that opportunity." What really struck Thiem about his character was that Juan Peron clearly "learned the power of a powerful woman. It can go a long way. When he ruled a second time he understood the power women possess and what they can accomplish." Evita's legacy still holds true to this day. Thiem expressed how he's "surprised that not more has been done with this story. People in Argentina will weep if you bring up Evita's name to this day." Eva's powerful history allows actor Kate Amatuzzo Thiem to challenge herself, which is the greatest reward of playing such an interesting and complex character. She enlightens, "no matter what the truth is, as an actor you have to bring the truth to the screen. Everything she does, she believes in 100 percent. And I have to play and approach her character that way."